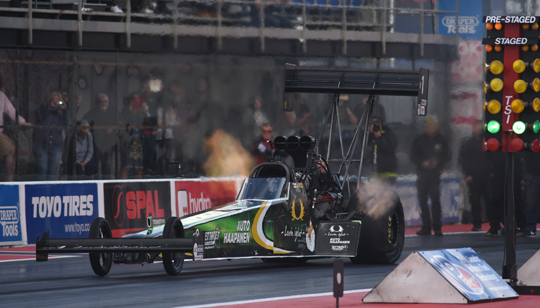 Antti Horto (Top Fuel), Timo Habermann (Top Methanol), Jimmy Ålund (Pro Modified) and Stefan Ernryd (Pro Stock) claimed the number one qualifying positions at the European Finals at Santa Pod Raceway and will lead their respective categories into Sunday’s eliminations at the sixth and final round of the 2017 FIA European Drag Racing Championship. 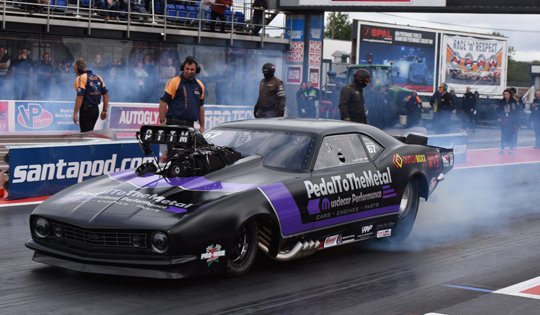 On Friday, a long rain delay was the reason that Top Methanol and Pro Modified were the only two categories that could make one qualifying run. On Saturday, the weather was once again not with the racers at all. The day started with sunshine, but when one qualifying round of all four FIA categories was completed, heavy rain showers once again delayed the event and at 7.15 PM the race director was left no other choice than to cancel the programme of qualifying day two of the European Finals, the sixth and final round of the FIA European Drag Racing Championship. 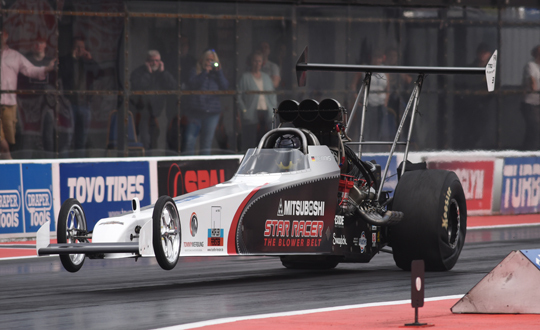 So in Top Fuel one qualifying round decided the elimination ladder. With only one pair to go, it looked like the European Finals would have a female top three. But in the last run Antti Horto stormed to 4.08 seconds to claim the number one qualifying position. 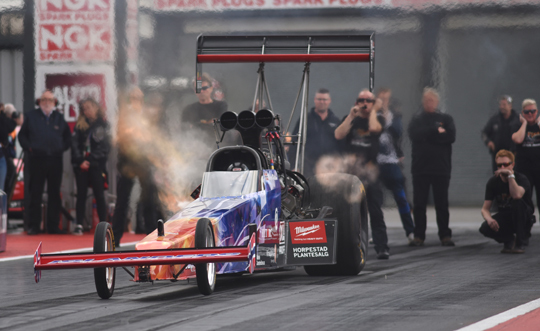 Outgoing FIA European Top Fuel champion Anita Mäkelä is the number two qualifier (4.24 seconds). 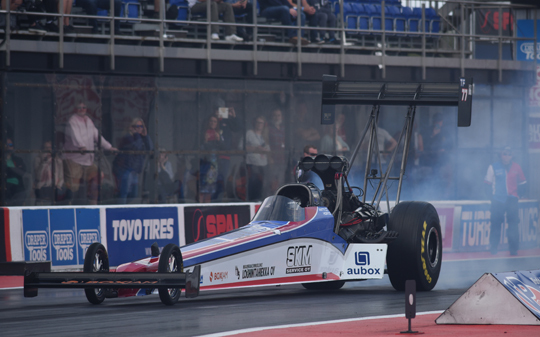 19-year old Maja Udtian from Norway will start her first Top Fuel race from third position, with Jndia Erbacher fourth. 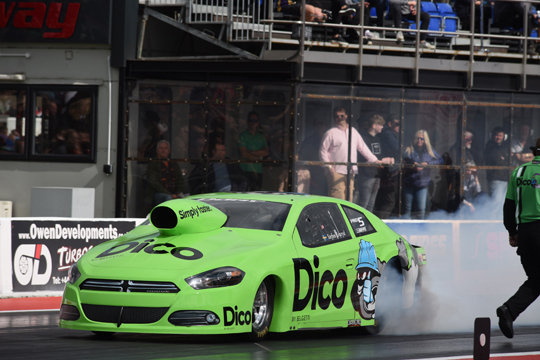 Duncan Micallef, leader in the championship, is the number five qualifier. 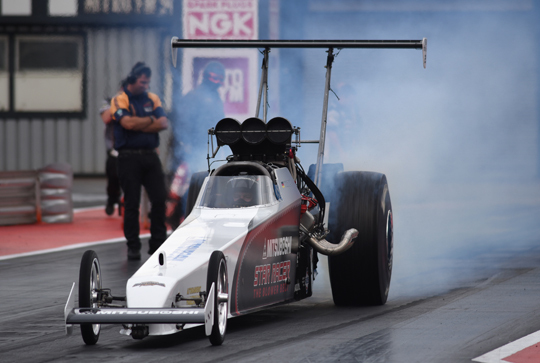 The Maltese driver will have to face Erbacher in the first round of eliminations, while Horto, the number two in the championship, will face Stefan Gunnarsson. Liam Jones, three times number one qualifier this season, had mechanical problems and is not qualified for the 8-car elimination ladder. 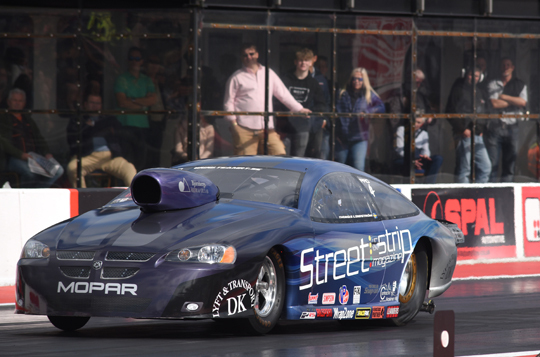 In Pro Stock Stefan Ernryd was quickest and claimed the number one qualifying position with 6.67 seconds. Thomas Lindström is the number two qualifier, with Robin Norén in third position. Championship leader Bengt Ljungdahl had to abort his run and ended qualifying in sixth position. 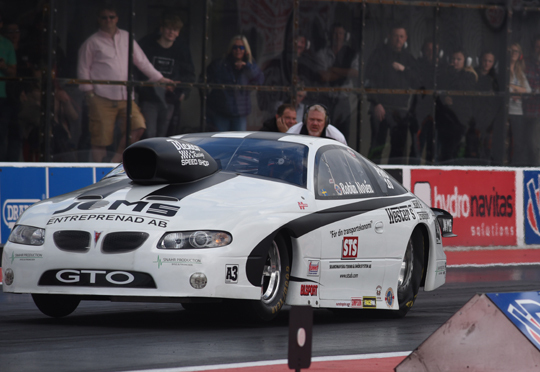 It will be a close fight in eliminations between Ljungdahl and Ernryd who will claim the 2017 FIA European Pro Stock title. In Top Methanol Timo Habermann improved on his yesterday performance to take over the lead from his brother and Friday leader Dennis Habermann. Timo’s best elapsed time was 5.434 seconds while Dennis recorded 5.435 seconds! Jonny Lagg remained in third position while Sandro Bellio is the number four qualifier. 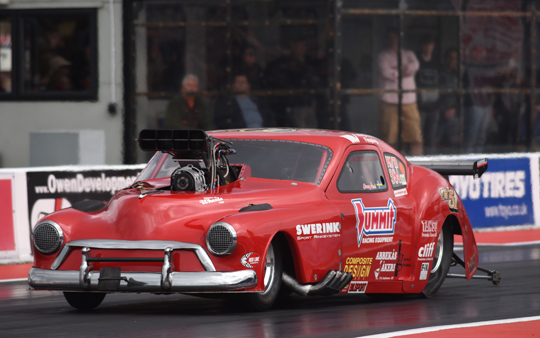 In Pro Modified Friday non-qualifier Jimmy Ålund stormed to a stunning 5.97 seconds to claim the number one qualifying position. The Swede was the only driver in the 5-second zone. There was no improvement for Friday leader Andy Robinson, but the local hero is the number two qualifier, with Bruno Bader third. 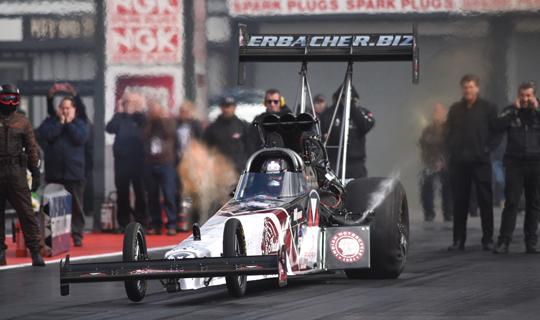 There was also a major improvement for David Vegter, and the number three in the FIA European championship jumped into fourth position with 6.10 seconds. Marck Harteveld is in fifth position, with Kim Kristiansen sixth. 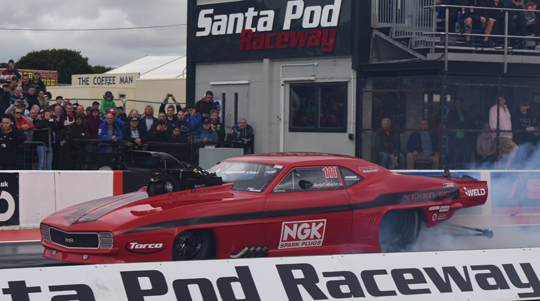 Michael Gullqvist, the 2017 FIA European Pro Modified champion, will start eliminations from seventh position. Eliminations for the European Finals will start tomorrow, Sunday, September 10.